The ideal option for small business ecommerce is here – with a feature set that delivers on modern shopping trends and your needs as a merchant, you can hit the ground running. 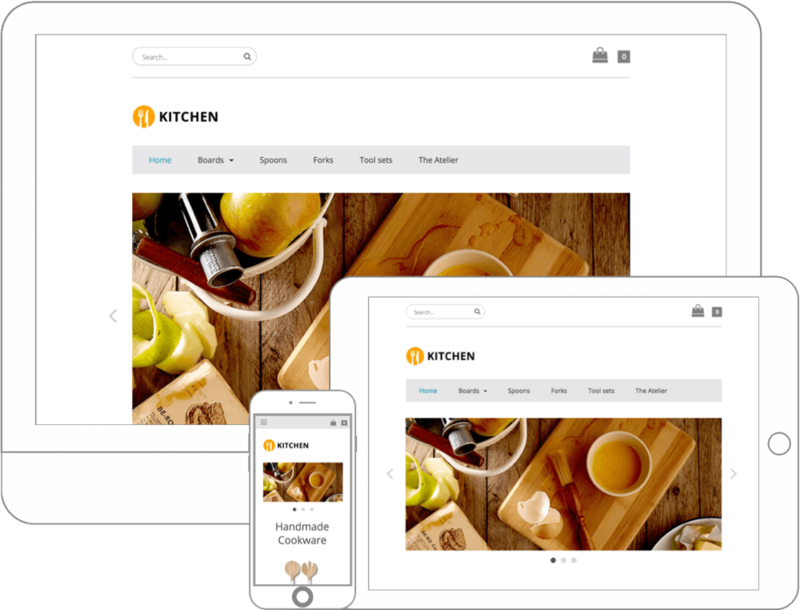 Consumers today demand that your online shop looks impressive and performs well across all types of mobile devices and tablets. ePages Now ensures that customers can enjoy your shop and place orders from anywhere. Setting up a beautiful online shop is now quick and easy for everyone – simply browse our attractive range of themes and select a design that best fits your brand and needs. Our design editor means your shop will come to life in minutes. 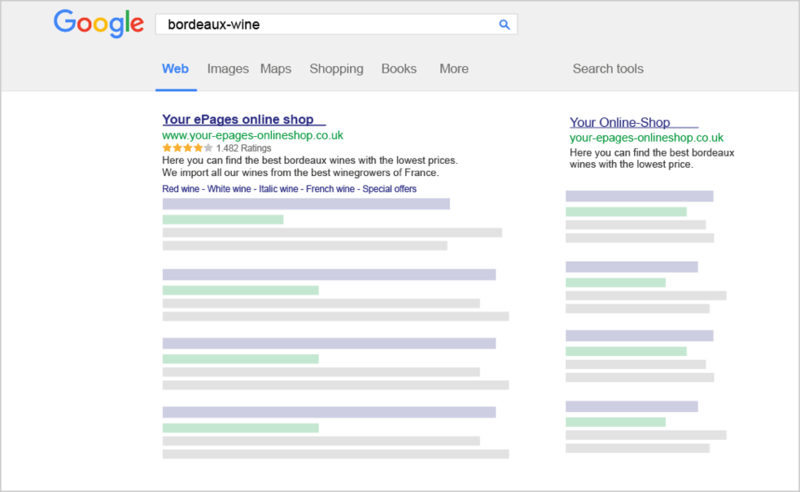 ePages simplifies and automates the search engine optimisation of your online shop. Always meeting the latest standards, your shop is equipped with SEO friendly URLs and tags to boost your selling success. Get online and achieve your first sales fast! Our guided tour helps you to quickly master the initial stages of setting up your online shop. In a step by step approach, ePages will guide you on how to add products, set up payment methods and much more. ePages provides you the help you need just where you need it. Our wealth of online support material means that any questions can be addressed quickly. We ensure that there are always helpful hints to gain from. The administration area of your shop is engineered to support your daily work with clarity and control over your ecommerce operation. Manage your content, select apps according to your business needs and oversee your orders and overall success across each of your sales channels. ePages makes it truly simple to add, modify or delete products. 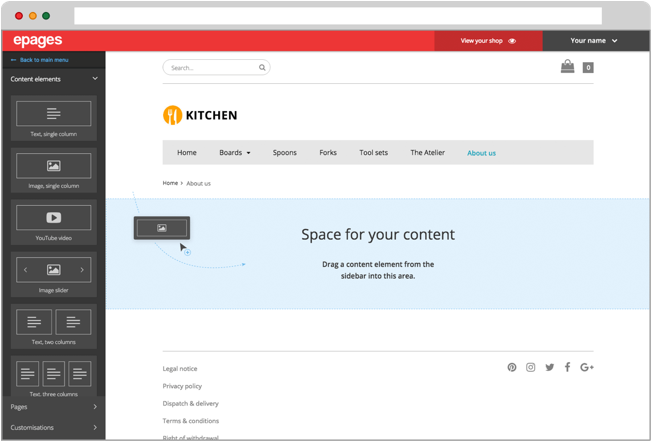 With an intuitive drag & drop editor you can add text, images or videos in seconds. Even setting up a completely new product line with multiple variations can be done swiftly. Always be visible and relevant to your target market wherever they are searching for products. 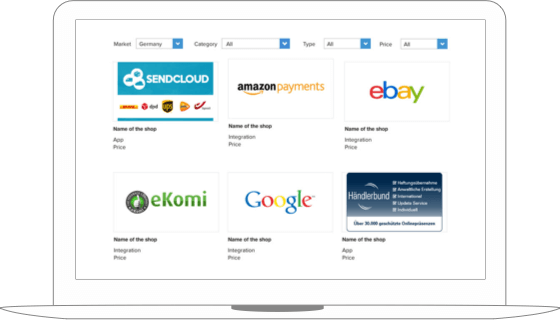 ePages includes the most popular marketplaces and portals such as eBay, Amazon and Google Shopping – configurable directly from your administration area. Fulfilment of your orders is always organised and efficient, with all areas within clear view. ePages has integrated the best payment, logistics and back-office features to support you. Always be on top of your stock levels. Guarantee a great shopping experience with tailored payment methods and trusted shipping options. Benefit from analytics apps and ambitious sales & marketing tools – either natively integrated or connected via ePages App Store. Create your professional online store in just a few minutes. Full service at an unbeatable price. Packages start from £15 a month with a free 30-day trial.